Yes, I'm going there. I'm never political. Its about the books. But yet, this impacts a community I love so, I can't stay quiet while a vote looms perilously close. You see - Net Neutrality ending impacts us all. Each one of us. 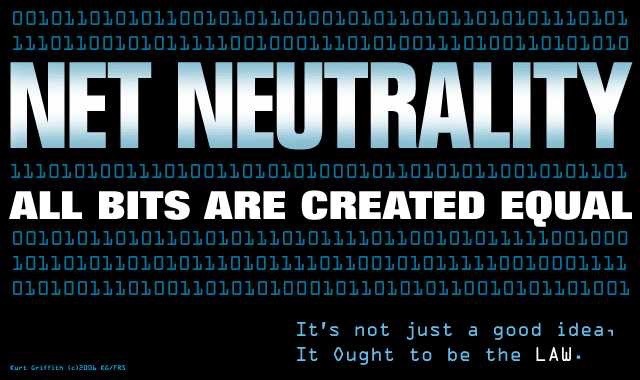 And we should not allow the big dogs in the fight to only be heard but each one of our voices should lift others in telling Congress and the FCC that eliminating Net Neutrality hurts everyone. If you use the internet to shop, communicate, run a small business, etc. 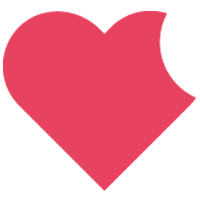 you need to care. Because if open internet goes, that means your followers may have difficulty finding you. I'm going to use two examples. Not far fetched but a definite reality. I currently use Blogger as the platform to support my website. I have for many years in its many configurations. But Verizon has a vested interested in Yahoo. That means it can charge a premium surcharge to have 'fast lane' or access to any Google platform. Think on it. If you want to read my funny commentary here or on BuzzFeed and have Verzion as your provider, they could potentially charge you to continue. There is a favorite rumor of mine. Mark Z is going to start charging you for using Facebook. Well, what if it wasn't Facebook, what if this came from your Internet Service Provider? Think of the daily interactions you have on Facebook. 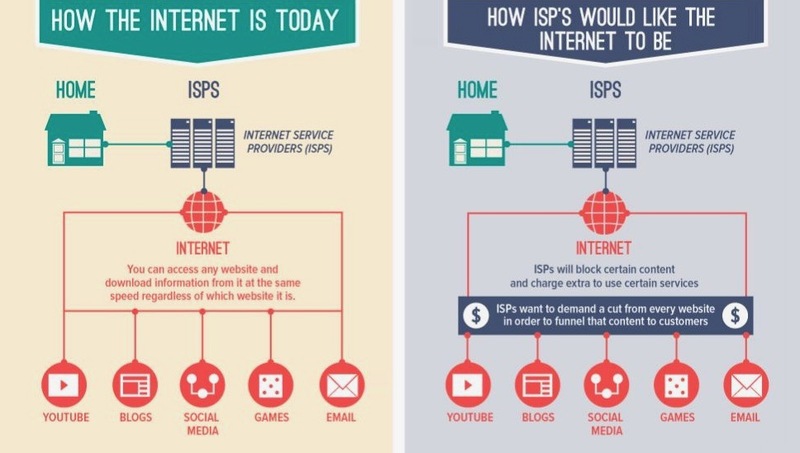 How can you not imagine these ISP's wanting to have a piece of that action to give you access or ask you to pay for 'fast lane' service to interact at the moment? If I was big business I'd look at all that commenting and say, "Yes, we can make money from that." Still think this doesn't impact you? Take a look at this graphic and think on what I am trying to express on how it may impact you. Now, I've not touched on your Netflix habit, your child's XBox Gaming, or your partner's personal trading. All these daily activities can take a slow down if the FCC is allowed to end Net Neutrality and you don't have the budget to pay extra for an experience you have now. The argument to leave this to Google, Microsoft and Netflix is weak. Although they are powerful corporations, it doesn't entitle them to more votes. And we, as a book community that relies heavily on social media and the internet to generate income, need to unite and let our elected officials know all traffic should be treated equally. 2007-2009 - AT&T was having Skype and other VOIPs blocked because they didn't like there was competition for their cellphones. 2012, AT&T - tried to block access to FaceTime unless customers paid more money. 2013, Verizon literally stated that the only thing stopping them from favoring some content providers over other providers were the net neutrality rules in place. The foundation of Reason's argument is that Net Neutrality is unnecessary because we've never had issues without it. I think this timeline shows just how crucial it really is to a free and open internet." Write your representatives and say, "Net Neutrality ending will hurt my business or the business of friends." Here is a link to democracy.io to let your voice be heard. Not sure how to write it? 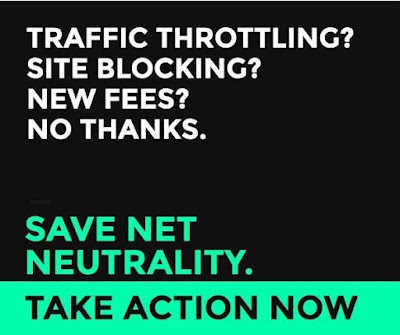 Here's a great article on how to comment on Net Neutrality from Mashable. If half of the likers of my Facebook page each wrote their representatives and said, "Net Neutrality needs to stay because there is no strong argument that eliminating it will benefit small business," that will be 250 more voices heard. 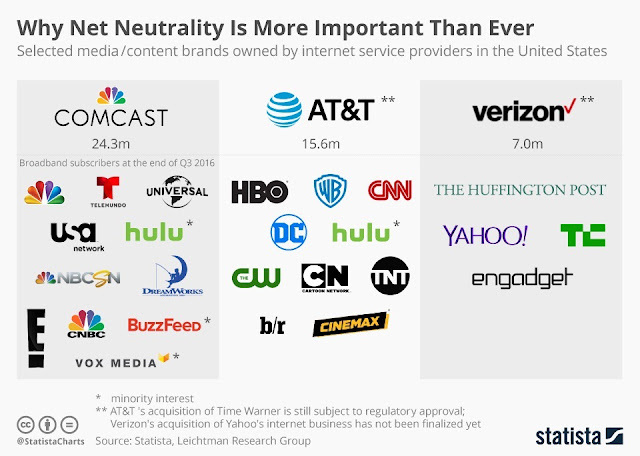 Net Neutrality is good for all to keep the internet an even playing field. Don't leave your voice to others. Let your voice be heard.